Stimulated by initiatives like devoxx4kids I have been looking around to see whether there is something I can use to get my kids (5 and almost 3) to get interested in technology. It seems there is plenty. 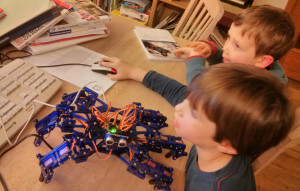 My kids are very interested in robots, so getting a Arcbotics Hexy was a big thing for them. It is really thrilling to see their reaction when the robot moves or dances. They find it really nice to be able to decide the movements of the robot with me doing the “programming”. The Hexy is more a toy for grown ups with at least some programming experience (or at least older children). There is a UI to trigger moves and you can customize or program moves using Python. Unfortunately though, it is always remote controlled and not possible to use the eyes using the more user-friendly interface. More is possible when directly programming the Arduino board, but this has not so easy (programming the Arduino board only works once every second try on my system). Laser pegs: Not programming, but still cool and getting them technology include. 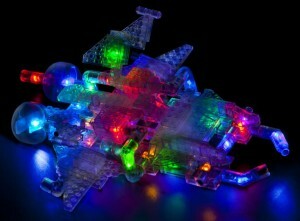 Allows you to put some light in your LEGO. And this was available in our local toy shop. scratch: no attributes needed, just giving kids control over a figure on screen. Visual programming for kids. They will need help until they can properly read, but should be feasable quite young. When the kids are a little older, you can also have a look at Greenfoot. Or they can start customizing Minecraft. Sparki: this is another Arcbotics project. This is more kids oriented, allowing them to program the robot using a visual interface (using Minibloq), make it draw stuff etc. I look forward to see my kids reaction to this one. These are expected to start shipping soon (end of 2013). Bo and Yana: Some very nice robots. They look very professional and will be iOS-device controlled. There will be a visual programming interface and the robots can interact with each other. The project seems to get a lot of traction. The robots should ship in the summer of 2014. Atoms: not necessarily a robot (though there are two robot packages) Atoms are electronic building blocks (thus the name atoms) which can be combined and remote controlled (using your iOS device again). There are sensor atoms, logic atoms, power atoms and action atoms. If you like the Lazer pegs, this seems to be taking that idea a lot further. Shipping should start any day now. Kano: Build your own computer. Based on a Raspbery Pi, put it in a case, add a speaker and connect. You now have a special computer for your kids to allow them to play their own games. With nine days to go in the Kickstarter project, they have reached their target 12 (twelve!) times. I think this looks very promising indeed. Shipping is expected the summer of 2014. I can’t wait for these toys to arrive. Playing with the children will be big fun.